If you aren't blessed with the largest of bathrooms in your home, you will more than likely to be looking for ways of making the most of what you have. If you have been asking yourself the question of how you can make your bathroom seem larger, we at Trade Price Tiles might just be able to help! Detailed below are three tried and tested techniques that we are confident will successfully create the illusion of space within a small bathroom at the same time as developing the calm and tranquil atmosphere you will be looking for. Dark colours can make any room look small, so if you already have a small bathroom, ensuring you use light, pale colours is essential. Following on from the use of light colours, the lighting you incorporate into the room has a big role to play in how large the room feels. Whilst large amounts of natural light is probably going to be difficult to come across, using high gloss wall tiles will reflect the light you have, resulting in a much larger looking space. 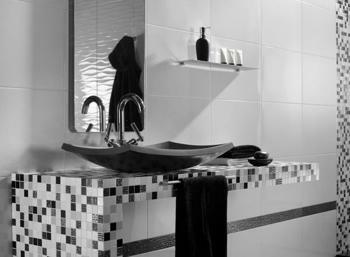 If you would like to introduce a darker tile consider using it on a feature wall or zone and again keep it glossy. Think carefully about your lighting choices. Spotlights, for instance, fitted across the ceiling not only look stylish but can brighten up all areas of the room to make it seem larger. Paint your ceiling in a reflective satin white finish. Tiles have a big role to play in bathrooms both large and small, and you will be pleased to know can create the illusion of space in your bathroom. Contrary to popular belief, using smaller tiles isn't always a smart choice in a small room; the key is to keep your decor simple and unfussy. Using a medium, plain tile reduces joints and other distractions for the eye, choose a light grout colour and avoid intricate fixtures and fittings. When choosing a floor tile , consider a rectangular design and lay it with the longer side running from the entrance to the back wall. This trick can make a room appear longer than it is. In a small bathroom with reduced floor space, saving space where you can is obviously going to make a big difference. Baths are unsurprisingly the biggest users of space in a bathroom. Ask yourself, as the owner of a small bathroom, do you really need a bath? If you rarely use your bath, consider replacing it with a standalone shower unit which will instantly develop space and consequently make the whole room seem larger. When fitting a shower in a small room, choose a wet room former instead of a shower tray, this means your tiles form a shower tray within the floor and allows the use of a plain glass shower screen resulting in simple, uncluttered lines. With these tips in mind, we hope you have now seen how you can make the most of your small bathroom, creating the illusion of additional space in a fully functional and incredibly attractive setting. 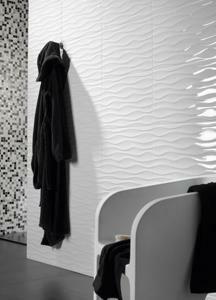 The product shown in this post is peronda wave white and the co-ordinating items in the range, by peronda.